Marine Villa is a self catering property, giving you the freedom and the privacy to eat what you like and when you like, but we are also delighted to offer you some alternatives as well. Instead of going to the restaurant, why not have the restaurant come to you, with one of the Isle of Wight’s top chefs personally attending Marine Villa to cook locally sourced ingredients and served by one of their team. Our Chef team have worked at some of the best restaurants the island has to offer. The impeccable style and ability to bring together plates of harmonious, charismatic and satisfying cuisine, makes fine dining at Marine Villa a dining experience that you will never forget. The menu will be decided after discussing directly with the chef what sort of dinner your prefer, and of course he can cater for specific dietary requirements. Obviously having the chef and the serving staff dedicated to your own group is not necessarily a cheap option, so budget for around £70 a head when considering this, but then again, this is not just dining out, this is dining in with serious style, for a night you will always remember and so will all your guests! Why not make it a Black Tie Dinner, or a Gatsby evening with Glen Miller playing throughout the house, and add some magnums of champagne and wine too? Pan fried scallops, prosciutto, butternut squash, garden pea & water cress purée. Pepper crusted Isle of Wight beef carpaccio, wild rocket, aged parmesan, essence of truffle, Isle of Wight rapeseed oil. Marine Villa, The Art-Deco House. All you do is to follow the simple heating instructions (we have THREE ovens for you to use) and you can have an amazing dinner, without wasting all afternoon preparing it! Have a look at the sort of menus on offer, and yes, our chef team will be delighted to work with you and make sure you have something special. You have probably never dined quite like this before! 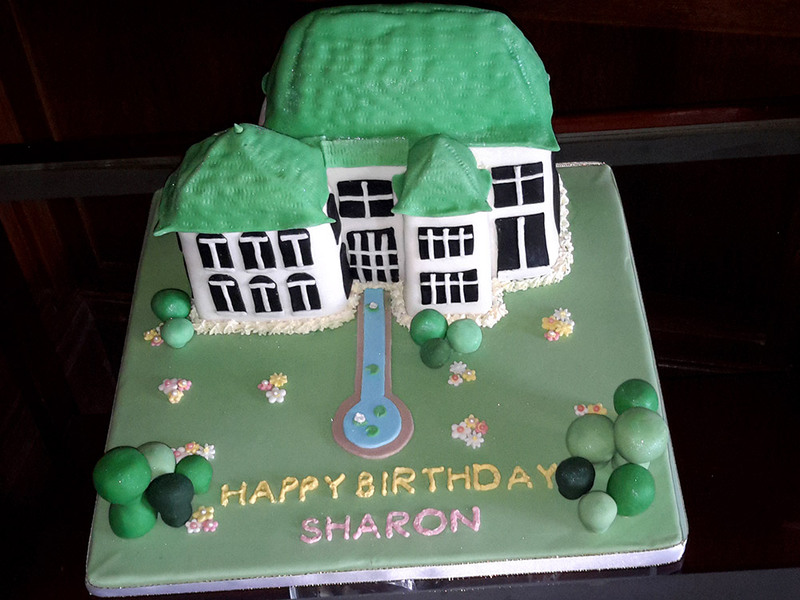 With such a unique house, we are delighted to offer you a custom made cake, with the cake ingredients of your choice, but the cake would be modelled on the house itself and be perfect to celebrate that special evening. Let us know if you are interested, and we will introduce our cake maker to you to discuss your requirements. e.g. smoked salmon & cream cheese, beef & horseradish, cheese & pickle, ham & mustard, cucumber and egg & cress. Variety of sponge cakes, classic Victoria with fresh fruit and cream topping, chocolate fudge, coffee & walnut, lemon drizzle and decorated cupcakes.. Plain and fruit scones with jam selection, butter and cream. Savoury scones (cheese, herb) are also available if preferred. Personalised miniature jam jar place names or favours can be decorated to coordinate with your event and contain home made jam with locally grown fruit when available. We prefer to always use local suppliers that we have evaluated and checked they offer a good service and are not only good value, but are also properly insured to work at our property. We want to do our best to try to help you have the best day possible. We do have a policy of using suppliers and contractors located on the Isle of Wight. If you do have preferred suppliers who are not on our list, please let us know, we do not mind, as long as we know in advance and they comply with our safety and insurance pre-requisites. We would need to have their contact details in advance. All contracts with third party suppliers are always between you and them and while we are able to suggest suppliers we unfortunately cannot take any responsibility for their services.